English standard silver is 925 parts per 1,000 pure silver. A lot of continental and foreign silver does not come up to the same high standard. It's more often only 800 parts per 1,000 or 850 parts per 1,000 pure silver. Most countries had a system of silver hallmarking, not dissimilar to that of Britain. 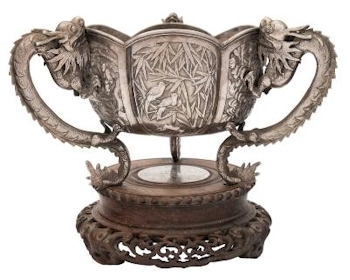 There are four main areas of foreign silver that appear in this category of our sales: Continental, Russian, Indian and now increasingly Chinese silver. A Chinese silver bowl, maker Wang Hing & Co, Hong Kong (FS40/79), which sold for £980. Continental silver in this category predominantly tends to come from France, the Netherlands, Germany and Austria. The Dutch have always been great explorers and traders. From Elizabethan times, they have had strong ties with England: in religious beliefs, sea-faring activities and trading interests. Dutch silverwares reflect these similar tastes, both in style and design. The most familiar items of silver are probably their spoons, usually cast, and often including a windmill that had working sails or miniature furniture that reflected designs of the day. The English love/hate relationship with the French does not extend to Dutch silver. With the Restoration of Charles II (who had lived in France and the Spanish Netherlands) in 1660 came an acceptance of French ideas. One of these was the use of silver forks as eating implements. 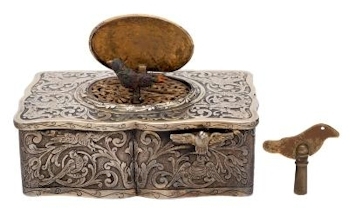 A German Silver Automaton Musical Box (FS40/80), which realised £1,500. The influx of persecuted French Huguenots, many of whom were silversmiths, and later the French aristocracy fleeing the French Revolution, also strengthened the influence of French silver. Possibly one of the greatest silversmiths to emerge from these connections was Paul De Lamerie, son of a French Huguenot nobleman. He was brought to England by his parents at the age of 11. De Lamerie went on to become, according the The Victoria & Albert Museum "the greatest silversmith working in England in the 18th century". A matched Indian Silver Three-piece Tea Service (FS39/90), which sold for £2,200 in a recent fine art auction. With the emergence of both the Russian and Chinese economies, there has been a surge in demand for items of pre-revolutionary silverware. The most famous firm of goldsmiths and jewellers must be Faberge. The firm was founded by Gustav Faberge in 1842 but it was his son Karl who took the business over in 1870 and took it to new heights. Based in St Petersberg, Karl Faberge opened shops in Moscow, Odessa, Kiev and London. The firm employed German, Finnish, Swedish and Russian craftsmen. These include Julius Rappoport, Henrik Wigstrom and Johann Aarne. Best known for the enamelled eggs made for the Imperial Russian family and jewellery for the Russian aristocracy, they also produced a wide range of very high quality wares. Chinese silver was exported through Shanghai, Canton or through the British colony of Hong Kong. The history behind the silversmiths and their marks is slowly emerging and during the 19th century, they were basically copying English silver designs for the Western market and even copying English hallmarks. One other continental designer that is worthy of a mention is the Danish designer Georg Jensen, sculptor, ceramist and silversmith. He studied at the Royal Academy in Copenhagen, and visited France and Italy. He opened his own jewellery workshops in 1904 and specialised in high quality, well designed silverware and jewellery. His designs for condiments and flatwares include famous patterns such as Acorn, Fuchsia, Dahlia and Blossom.